Binocular Harnesses - What's a Good One? Binocular Harnesses Take a Load Off Your Neck! Binocular harnesses have been steadily gaining in popularity for several years and there's no sign that the trend is going to stop any time soon. Who uses them? People who use binoculars that are somewhat heavier than they're comfortable with on their necks. You're probably saying "But that could be anyone!" and you're exactly right, of course. Bird watchers on lengthy excursions certainly appreciate them. Hunters are another group of binocular users that find them very useful. There's another group, photographers, who use the same harnesses for carrying heavy cameras. Although great progress has been made in producing lighter binoculars in the past several years, there is no way around the fact that larger objective lenses weigh more than smaller ones. And sometimes a larger objective lens is what it takes to satisfy a particular need or priority. Of course, a medical condition might dictate using a binocular harness, too. Usually, however, we find that people simply like them because they relieve neck strain that comes from carrying binoculars for extended periods of time. With the traditional neck strap, the binocular's weight rests entirely on the back and sides of the neck. Over time, particularly if the binocular is bouncing around as you navigate terrain; it takes a toll on the neck muscles. A wider or more padded neck strap can relieve some of that, as can a neck strap with a bit of elasticity to it, but the better solution is a binocular harness. Unless you're carrying a binocular for which you really should be using an old fashioned, military gun carriage, you're likely to forget all about the binocular after only a short while. Someone using a binocular harness typically finds that the binocular is held snug against the body and it doesn't bounce significantly — which also reduces muscle fatigue. If you've ever leaned over to tie a shoe and had your binocular swaying between your face and your shoes, you'll likely see merit in it being held against your body. Since most binocular harnesses ("binocular suspender" is another common term) use elastic straps, there is a small amount of "give" that also helps to reduce muscle fatigue. If you have children or grandchildren, you may already be seeing the benefits of having both your hands free and your binocular not swaying back and forth! The design of most harnesses provides for being able to easily raise the binoculars to your eyes even though they're held snuggly against your body. The elastic straps also help here in that they'll stretch to allow you to look up or sideways conveniently. It's both practical and comfortable. Finally, a significant benefit to our way of thinking is that a typical harness can be adjusted to fit you easily if you're wearing a thinner summer shirt of a jacket in the middle of the winter. They are very adjustable! We know of some for whom the manufacturer's dimensions were unnecessarily generous. They simply cut out a bit of the excess and put a few stitches in to hold it together again. 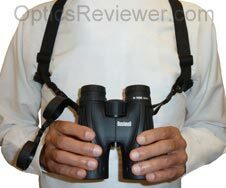 Most of the binocular suspenders are of the same basic design and simply have a private label (brand name) put on them. The most common design is that which uses a relatively small, but thick, piece of leather to hold the straps in place in the middle of the back. We like this design for its simplicity and for use in hot, humid weather. This is good, but the small area where the straps are held by the leather in the middle of ones back may not always be comfortable for some. Another design incorporates fabric, usually with holes for breathability and mesh under the fabric to make it feel better in humidity, to overcome the discomfort in having the smaller leather piece in the middle of the back. Bushnell's binocular harness is one of these and is reasonably priced for this type of harness and it's also available at Amazon.co.uk . For our friends in North America, we would get the OP&sol;TECH USA binocular harness is priced about 25&percnt; less than other binocular harnesses for essentially the same item. We think it just makes sense to get one of these and use the savings for something else. The only major online retailer carrying it that we've found however, is Amazon.com (USA) . It also look like Amazon.co.uk carries it at a good price for our friends in the UK — again, significantly cheaper than those harnesses with name brands sold at higher prices.